We’ve got lots of sand – have a look at a map of Arisaig and you’ll see all the yellow marks on the map. 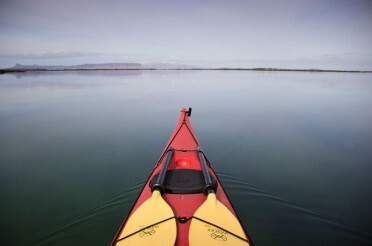 There are some fantastic beaches to land a sea kayak on and go exploring. Some of them are quite close to the coastal road and great places to go with the family for a relaxing day on the beach, others are more remote. 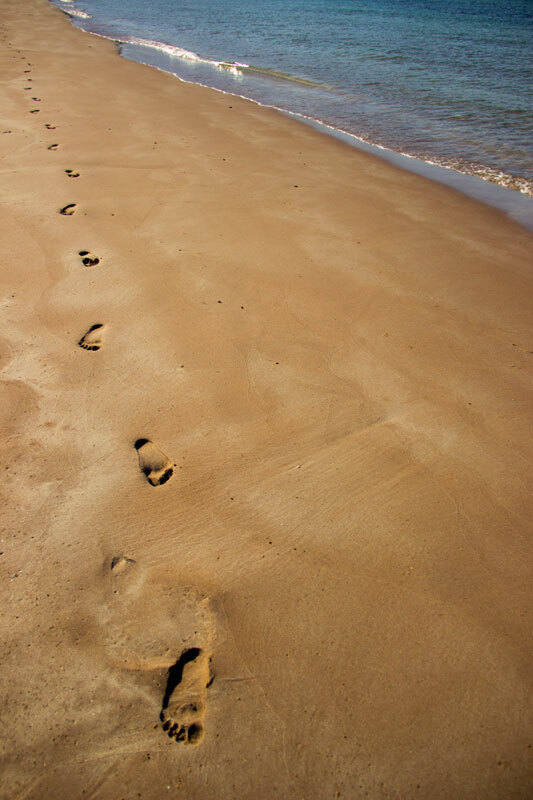 We can even take you to some hidden places where its likely that ours will be the only footprints on the beach (aside from the tracks of Otters and Deer that is). 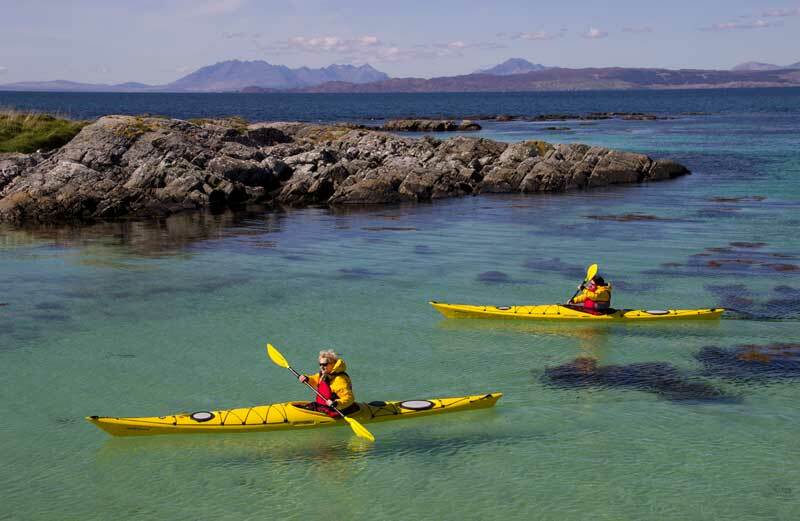 Landing a sea kayak on a remote beach is one of the joys of a sea kayaking trip in Arisaig. Footprints through sand on an unmarked beach. The Skerries are a group of Islands and sand at the entrance to Loch Nan Ceall, not far from our sea kayak centre in Arisaig village. 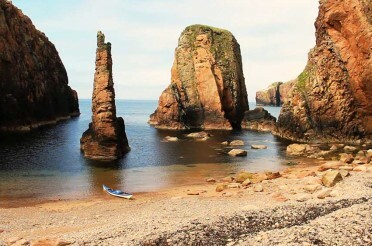 They make a brilliant sea kayaking trip and are perfectly suited for beginners or even any skill level of sea kayaker. 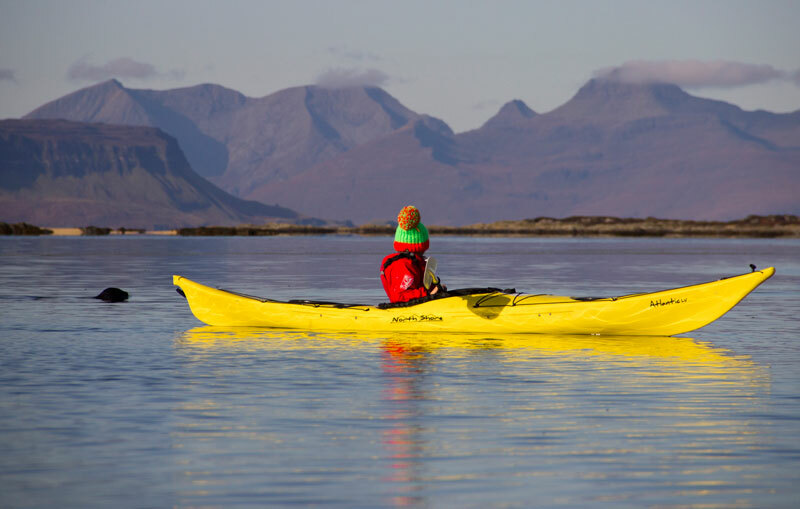 Inshore of the Islands is often very calm in the summer and the outside can be a lot rougher – perfect for those sea kayakers looking for more of a challenging day out. The Arisaig Skerries are packed with wildlife – there are over a hundred Common Seals that make the area their home and also a large number of sea birds such as Terns, Gulls and Divers. 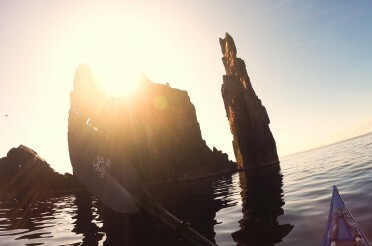 Take a look at our guided sea kayak day trips. 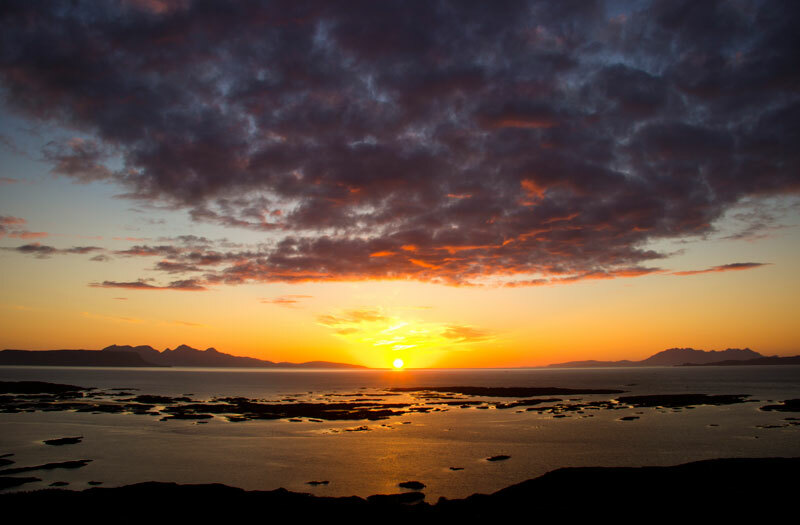 Sunset over the Arisaig Skerries. 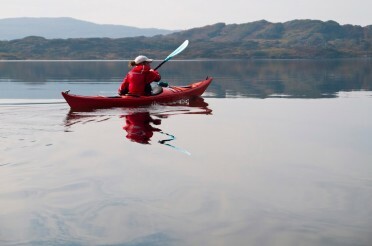 Sea kayaking in the Arisaig Skerries. Arisaig has an almost clear view to the West, the skyline is only broken by the outline of the islands of Eigg and Rum. 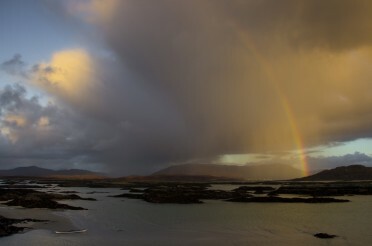 This means that this part of the West coast of Scotland is famous for its sunsets. 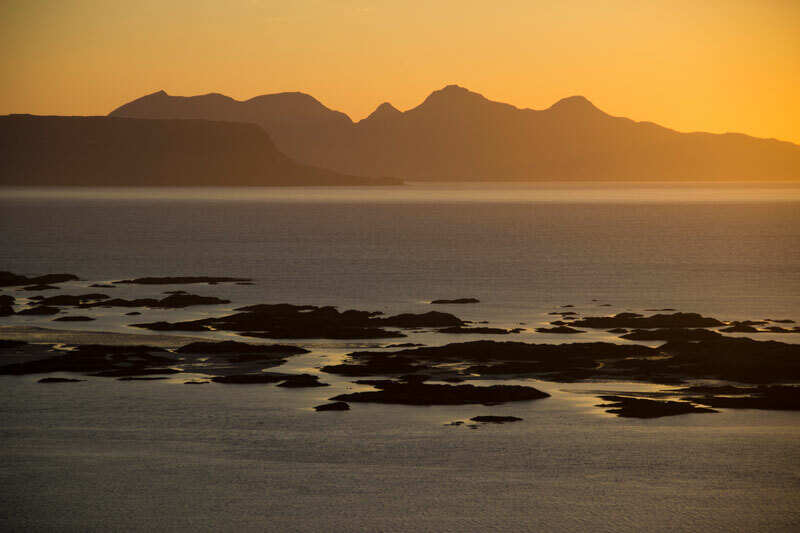 Sunset seen from Arisaig on the West coast of Scotland. 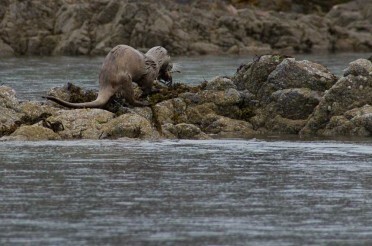 Arisaig is home to hundreds of Common Seals. They live in the Skerries and out on offshore rocks and islands and can be seen very easily from a sea kayak – in fact we see them on pretty much every single trip we do. They are very curious and often swim quite close to the kayaks to take a closer look. The Seals do have special protection and we do operate under a code of conduct in order to minimise disturbance. However, if they are treated with respect then they are very playful and beautiful animals to watch – especially brilliant when you are in a sea kayak. 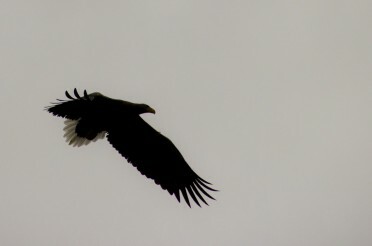 Mor information on Arisaig Wildlife. Common seals swimming behind a sea kayaker in Arisaig. Rough or smooth – we have exposed headlands and sheltered bays to choose from. We can select from a lot of different trips and choose a sea kayaking location that is perfectly matched to your skills and confidence. If you want some challenging sea kayaking we can go on a long journey or paddle in rougher water but if you just want a relaxed afternnon out we can choose a sheltered bay to explore. 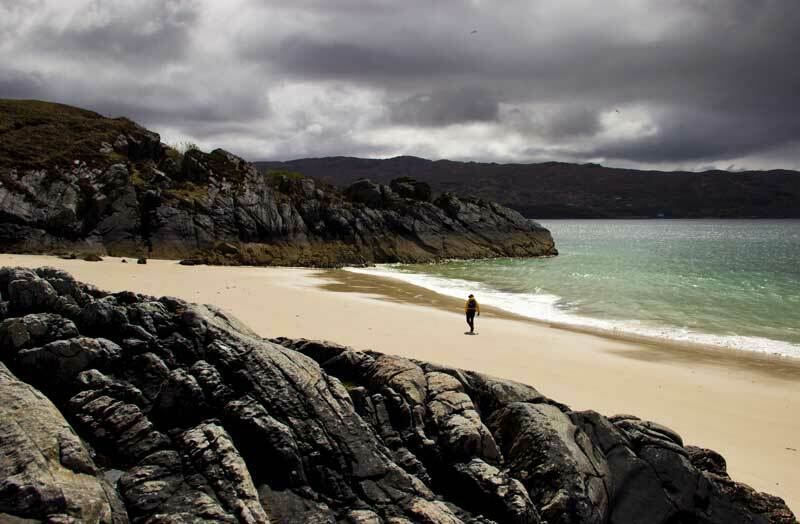 Arisaig is on the edge of a very wild part of Scotland – finding some space to take step back from life and to engage with a wild place is very easy in Arisaig. We just have to paddle for a few miles and the sense of wide open space and epic wilderness is amazing. This is the ‘rough bounds’ of the Highlands of Scotland, wild and remote in places but also wild and accessible in other parts. 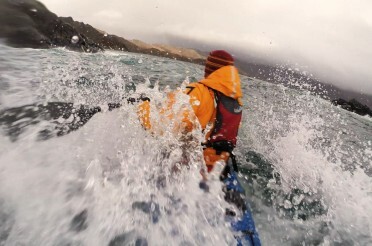 We don’t have to go sea kayaking for weeks on end to find wild places on the West coast of Scotland.